Hey there! 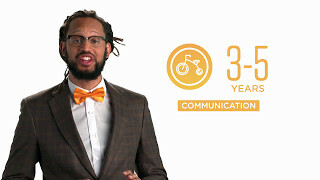 I’m Stephen Brackett, bringing you the Colorado Early Learning and Development Guidelines’ video for 3-5 years … Communication! At this stage, your child may have hundreds of words stored up in their little brains…. And they are probably trying to use them all in a single day! Encourage them to share his thoughts and ideas. When a child feels “heard” they’re more likely to share what’s happening in their life. Right now, conversations with your child may be all about things like aliens and princesses, but if your child knows you’ll listen to them, they’re more likely to keep you in the loop as they get older and really need your support. Hey there! 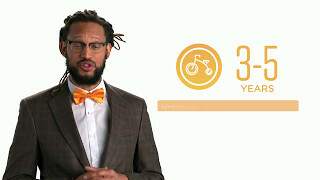 I’m Stephen Brackett, bringing you the Colorado Early Learning and Development Guidelines’ video for 3-5 years … Understanding our society. At this age, many children are ready to learn more about our society. And discuss things that happened in the past, such as a family trip. Tell them stories about their family, including relatives they may not see all the time. Remind them of things you’ve done together. Show them how and when to use their manners. Create games where they exchange play money for the things they want. Start involving them in shopping trips, so they can see money in action. To learn more about what most kids are doing from 3-5 years old, check out the Colorado Early Learning and Development Guidelines at: www.earlylearningco.org. Most importantly, if you feel you child isn’t hitting some of these milestones then please… call your pediatrician. By working as a team, you can help your child can get all the support he or she needs. Hey there! 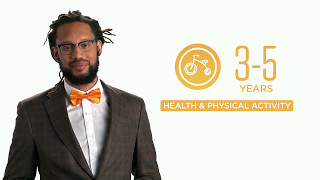 I’m Stephen Brackett, bringing you the Colorado Early Learning and Development Guidelines’ video for 3-5 years … health and physical activity! At this age, many children are learning more about their bodies and healthy habits. Need a little extra sleep, in longer stretches. And demonstrate eye-hand coordination, such as catching balls, using utensils properly and building things with boxes, clay or stringing beads. Give them the chance to take over some of their basic hygiene tasks, such as brushing their own teeth, brushing their hair, washing their hands and feeding themselves. It’s also important for you to model how to take care of yourself, especially when it comes to exercise and healthy eating. Play with them, go for walks together and eat healthy snacks with them. They’re following your lead, so make the right impression! If you’d like more information on what to expect from your 3-5 year old, check out the Colorado Early Learning and Development Guidelines website at www.earlylearningco.org, where you can download the guidelines, find links to more resources and watch more of our videos. And remember… all children learn, grow and develop differently. If you’re concerned about your child, talk to your pediatrician. Hey there! 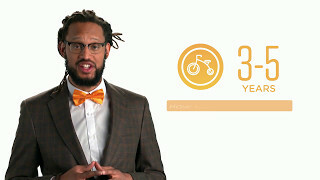 I’m Stephen Brackett, bringing you the Colorado Early Learning and Development Guidelines’ video for 3-5 years … How they think and reason! At this age, many children start focusing on how they “fit” in the world. If they offer up an answer that won’t work, try prompting them before giving them the answer. Provide them with props for their pretend play, such as sheets and pillows to build a fort or a space ship. Not only are you encouraging their imaginative play, you are also demonstrating problem solving. Hey there! I’m Stephen Brackett, bringing you the Colorado Early Learning and Development Guidelines’ video for 3-5 years … IMAGINATION! At this age, your child may start exploring cultural and creative ideas. Keep playing with your child, and follow their lead. It doesn’t matter how silly their game may seem, just go with it and have fun! Give them lots of colorful ways to make art. Try different papers. Let them play with crayons, paints, beads, and other colorful materials all at once and see what they come up with. Even better? Join them! And finally, give them props for their pretend play, such as sheets and pillows to build a fort or a space ship. Not only are you encouraging their imaginative play, you are also demonstrating problem solving. Even though it’s easy for us to get wrapped up in chores or work, keep playing with your child. It’s a real confidence booster that you want to play with them… plus, when’s the last time you got to fight off dinosaurs from a space ship made of marshmallows? Hey there! I’m Stephen Brackett, bringing you the Colorado Early Learning and Development Guidelines’ video for 3-5 years … Interaction and expressing feelings! And following simple rules and routines. Lead by example! They’re learning how to interact by watching you! Engage them in conversation, and remember to give them the time they need to complete their thoughts. Give them a safe spot to call their own, somewhere they can go to calm down or just be alone if they want. Most kids go through a big round of emotional, intellectual and physical growth at this time. The more you teach them about managing their emotions and using their words, the more likely it is they will have the control and confidence they need to be successful. To learn more about what most kids are doing from 3-5 years old, check out the Colorado Early Learning Development Guidelines at: www.earlylearningco.org. Most importantly, if you feel you child isn’t hitting some of these milestones then please… call your pediatrician. By working as a team, you can help your child can get all the support he or she needs. Hey there! 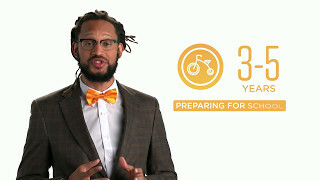 I’m Stephen Brackett, bringing you the Colorado Early Learning and Development Guidelines’ video for 3-5 years … Preparing for school! And recognizing their name in writing. Write their name over and over and see if they can copy it. Let them “read” to you. Set up daily routines, including a little down time. Point out patterns, shapes and colors in your home and when you’re out on walks. And frequently remind them of what your rules are and how to follow them. Around this age, your child may be moving towards being a little more independent. It’s important that you try not to hover or constantly correct them. As long as they’re safe, try to give them the time and space they need to start figuring things out for themselves. To learn more about what most kids are doing from 3-5 years old, check out the Colorado Early Learning and Development Guidelines at: www.earlylearningco.org. At this age, kids build skills that prepare them for school and life. Their bodies, brains and feelings are continuing to develop as they explore their world. Their learning develops into different subjects, like math and science, as they prepare for kindergarten. Get dressed, brush their teeth, use the toilet, and wash their hands without help from adults. Encourage them to show independence in basic tasks to care for themselves, helping when necessary (e.g., brushing teeth, wiping nose, dressing, using the toilet, washing hands, and feeding themselves). Walk, run, hop, gallop or balance on one leg. Make physical activity a big part of their daily life and provide space and equipment for them to play. Make sure they are safe and properly dressed for the weather and specific activities. Engage in activities that enhance hand-eye coordination, such as using eating utensils, dressing themselves, building with blocks, creating with clay or play dough, putting puzzles together, and stringing beads. Show them how you use drawing and writing tools in your daily activities (e.g., making a grocery list). Make friends and learn how to help, share, take turns, and resolve problems. Show them how to interact with others (e.g., take turns playing with a certain toy). Provide opportunities for kids to understand and discuss their feelings and those of others. Help kids see the effect of their behavior on others and help them resolve conflicts. Begin to control their impulses and feelings better. Follow simple rules, routines, and directions. Make cozy, safe places where children can be alone if they wish. Establish, explain, and model simple rules (e.g., a bedtime routine) in basic terms they can understand. Express a range of emotions appropriately, such as excitement, happiness, sadness, and fear and avoid disruptive, aggressive, angry, or defiant behaviors. Show and talk about ways to appropriately express emotions (e.g., dancing or exercising until out of breath, using pounding toys, manipulating play dough, talking to an adult). Use a greater variety of words when they speak to express ideas and events. Introduce new words and concepts by naming what they are doing and experiencing. Have conversations and ask them open ended questions that require more than a “yes” or “no” response. State directions clearly, positively, and respectfully. If it seems like they need help, show them what the directions mean and provide help if needed. Share their ideas and experiences in small groups. Describe experiences and retell simple stories. Ask open-ended questions that require more than a “yes” or “no” response. Give them opportunities to tell stories or describe events and provide prompts as needed for encouragement. Handle books respectfully and appropriately. Look at pictures, ask questions, and talk about pictures and information in a story. Read to them often for fun and to help them learn new things. Act out and retell stories using props such as puppets. Recognize the difference between words that sound similar, words that rhyme, and words that start with the same letter. Show them how to have fun with words (e.g., rhymes, poems). Recognize the letters in their own name or know many letters of the alphabet. Provide magnetic letters and alphabet blocks, stamps, books, and puzzles. Explore letters through physical experiences (e.g., use alphabet cookie cutters or pasta alphabets, make letters out of your bodies on the floor). Point out letters in familiar names and signs. Recognize that printed words connect to their world and daily life. Point out signs and labels in the home, neighborhood, or store. Call attention to a variety of printed words, such as in books, newspapers, magazines, menus, and cereal boxes. Use shapes, symbols, and letters to express ideas. Encourage their interest and attempts to copy or write letters and their name. Encourage them to use markers, crayons, and pencils. Think through problems and try to solve those problems in different ways. Ask them questions that apply to real problems and talk with them about different approaches to solving problems (e.g., It is cold outside and I see you only have one glove. What should we do so your hands stay warm?). Encourage them to think through how to solve problems, even if their solutions aren’t right. Encourage them to pretend, such as using sofa cushions or blankets to make a “cave”. Offer new props to encourage pretend play. Count, group, and sort objects by size, shape, color, or other similarities. Take advantage of every opportunity to count, group and sort objects. For example, encourage children to group and sort toys when cleaning up (e.g., all the blocks, all the soft and hard animals). Create patterns using art materials and other objects (e.g., weaving, painting, stringing beads, and building blocks). Point out naturally occurring patterns indoors and outdoors. Introduce songs with evolving patterns (e.g., “Bingo” where children clap to substitute additional letters with each verse). Ask questions and observe the living things around them, like bugs, plants or animals. Provide opportunities to observe objects and events indoors and outdoors. Observe nature and make guesses about natural events. For example they may explain how seeds grow, or how you should care for animals. Encourage kids to ask questions and seek answers by exploring and thinking about what they see. Express ideas in many ways using their imagination and creativity. They may draw stories or things that interest them. Provide age-appropriate art materials, like different types of drawing tools, paper, and collage materials. Identify how money is used. Create play situations in which they exchange money for objects. Offer different types of music and have them participate by clapping or playing musical instruments. Provide them with examples of diverse music, including cultural examples and examples in their community and home. Create drawings based on familiar stories and topics. Use different types of art materials (e.g., paints, paper, markers, crayons, boxes, clay, and plastic containers) to help them retell a favorite children’s book. Play pretend for longer periods of time. Encourage them to pretend by using props such as dress up shoes, pots and pans, and stuffed animals to act out stories and real-life experiences that will get them to think about different roles and scenarios. Talk about wanting to learn about a lot of different topics. Share their excitement in discoveries and learning. Help them explore and learn more about their neighborhood and community. Show them how to be curious and how to find information. Act curious yourself. Play with other kids and take turns. Provide opportunities and role model how to play with others. Practice asking for a turn, asking how long it will be until they can have a turn, and listening to friends.